1" square tubular construction (14 gauge). Offset handle 10" above top shelf. Clearance between shelves - 18". 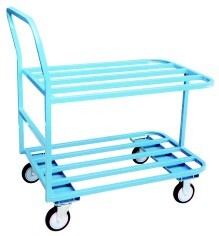 Top deck height - 27", with Full Pneumatic Casters - 31".